A long, long time ago (well, August 2013, i.e. 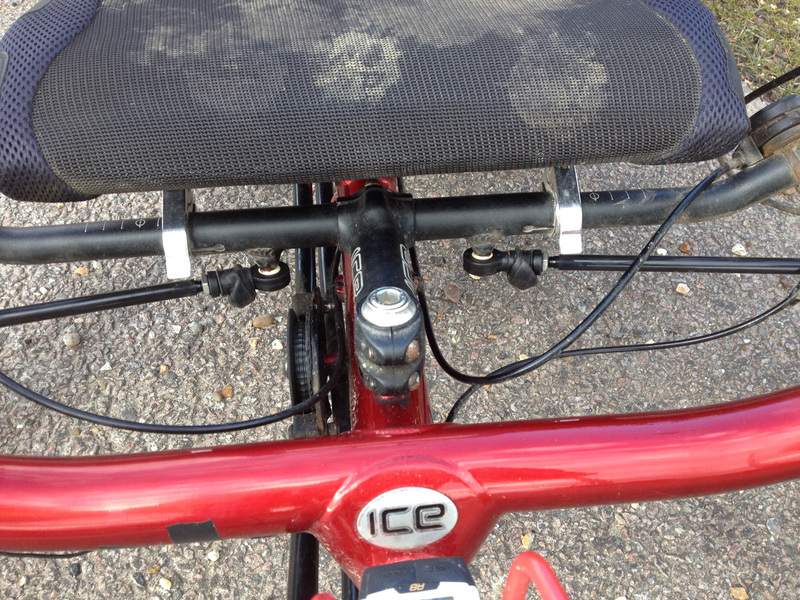 six months ago) I realised that the ball joints on my track rods on my ICE Sprint trike had got rather worn. This meant that they wobbled around a bit and consequently the trike’s tracking was rather variable. In other words, if you stood between the two front wheels on the trike you could pull them towards you or push them away from you a couple of millimetres. They should always be parallel and shouldn’t move independently of each other. 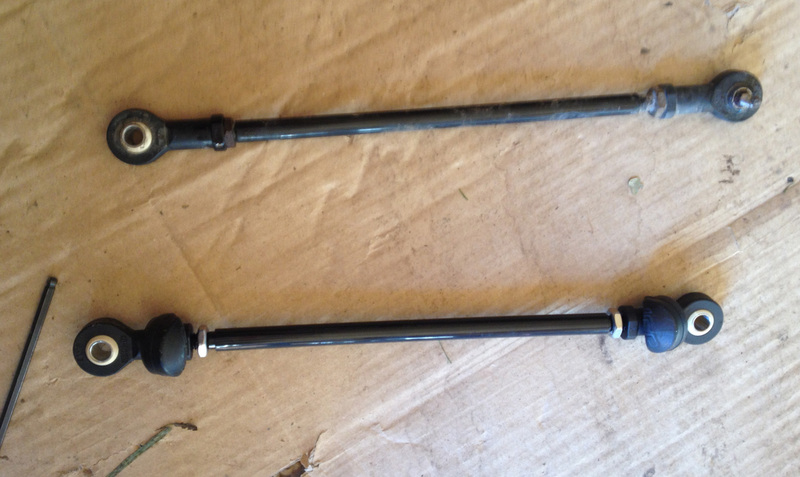 I contacted ICE who sent me replacement track rods. However I was a bit nervous about doing this job as the allen bolts holding the old track rods in the ball joints were hugely corroded and didn’t look like they would undo (I didn’t try very hard as I didn’t want to break anything). Neil at ICE sent me replacement bolts in case I had to drill these out (worst case scenario). I procrastinated and procrastinated but realised I needed to get this job done before I flee to the continent (move to Germany to live for a while) as all our tools are here. 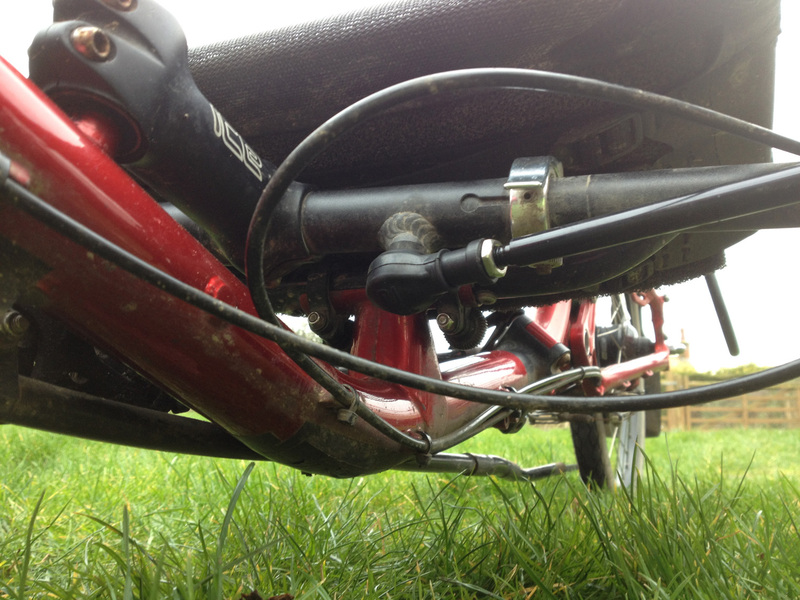 So today was the day – a sunny if slightly chilly March day to do a bit more trike maintenance. This was a two stage operation – removing the old track rods and fitting the new ones, and then tracking the wheels so that they are pointing the same way. This was what I was worried about – would these things come off! 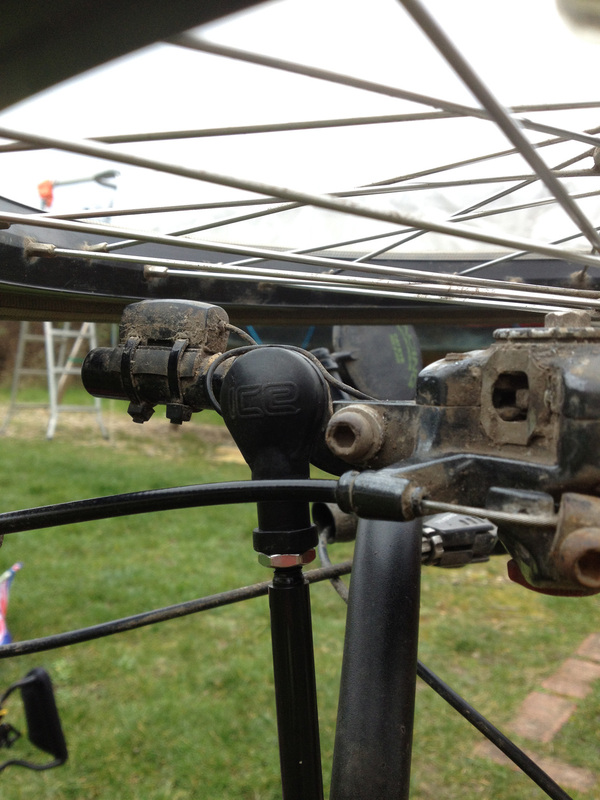 This is the trike lying on its side and the track rod (the straight black bit of pipe between the two arrows) is the thing I need to remove. 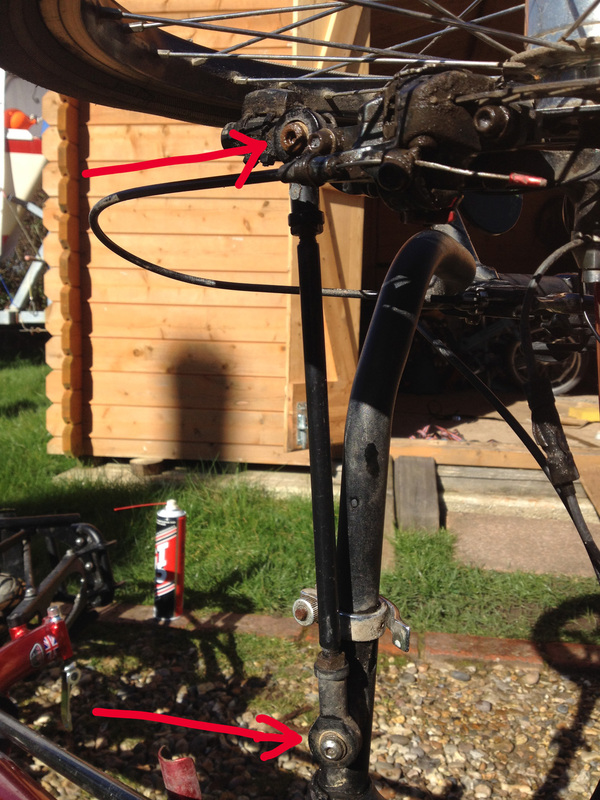 It’s theoretically a simple removal – just undoing the two bolts indicated by the red arrow. It’s fairly obvious these are made of different metals – the top one is very corroded (I had tried to remove it six months ago and it didn’t budge) and the bottom one still looks pretty pristine silver colour. Mind you, the one lower down in the picture doesn’t get splashed much whereas the top one gets lots of muck off the wheels and brakes. We sprayed the allen bolts with GT85 before we started to see if this would help. 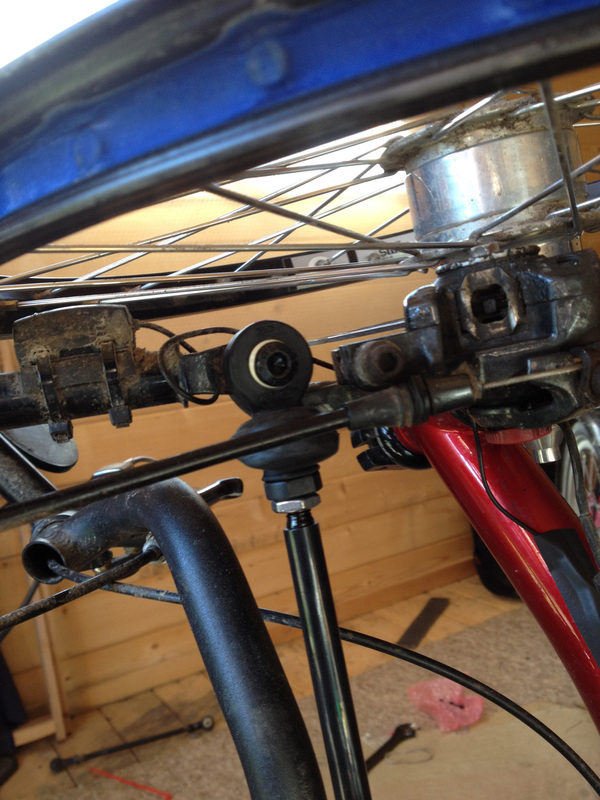 Rather surprisingly, I was able to undo both bolts without too much difficulty. I had to use more torque on the top one than I had used before as it didn’t matter if I ‘broke’ it (I had replacements from ICE) but in the end it undid OK. When I took it off the wheel flopped to the side rather drunkenly! And here is the old one beside the new one. Notice a rubber collar thingy on the bottom (new) one? this is an enhancement by ICE, a set of gaiters which roll over into place once the track rod is fitted to protect the area and stop it corroding. Yet another example of ICE’s attention to detail. So now it was time to work out which way round to put the track rod (so that the thread was in the right direction) and then screw it in place with the new bolts. 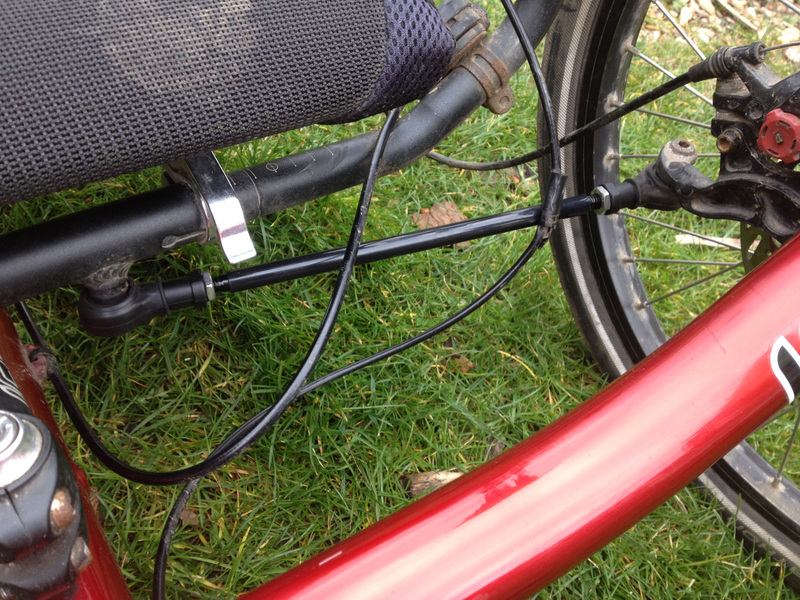 Here is the new track rod attached at the handlebar end. And here it is at the wheel end. We then repeated this procedure on the other side – stage 1 was complete! 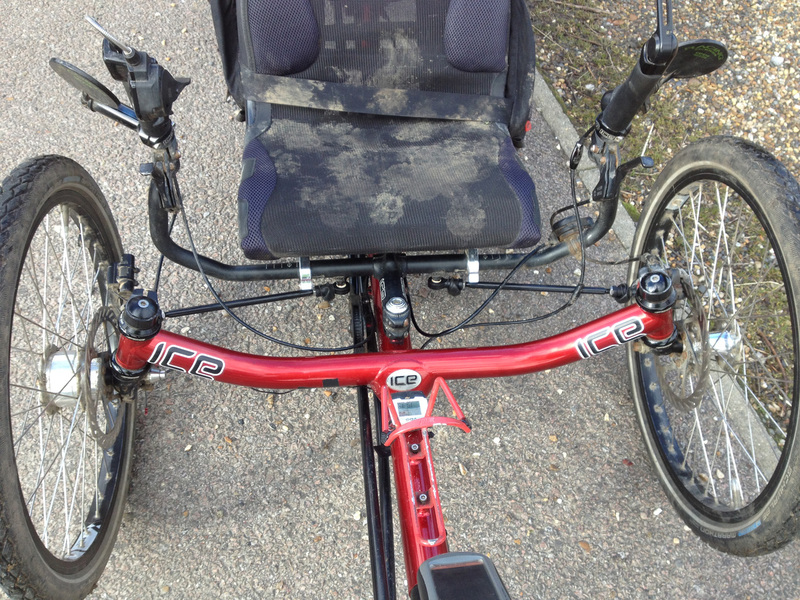 Rather fortuitously, ICE Trikes have developed a Youtube video which explains how to do this very task in detail. James and I had watched this before we began. They suggest various tools to help you and we were able to find suitable ratchet straps and a couple of rulers to help measure the distances between the wheels and the frames to line things up. 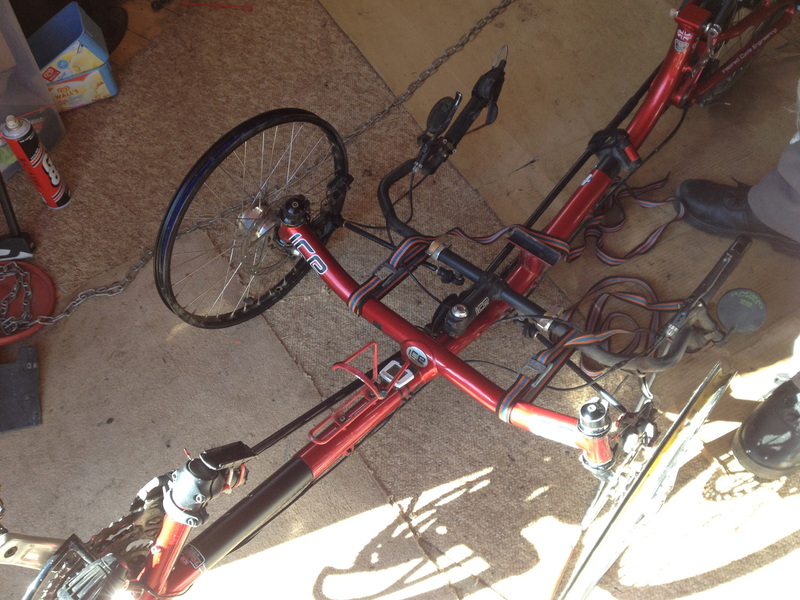 So first of all the set the handlebars to parallel to the crossbeam of the frame so that nothing would move around. 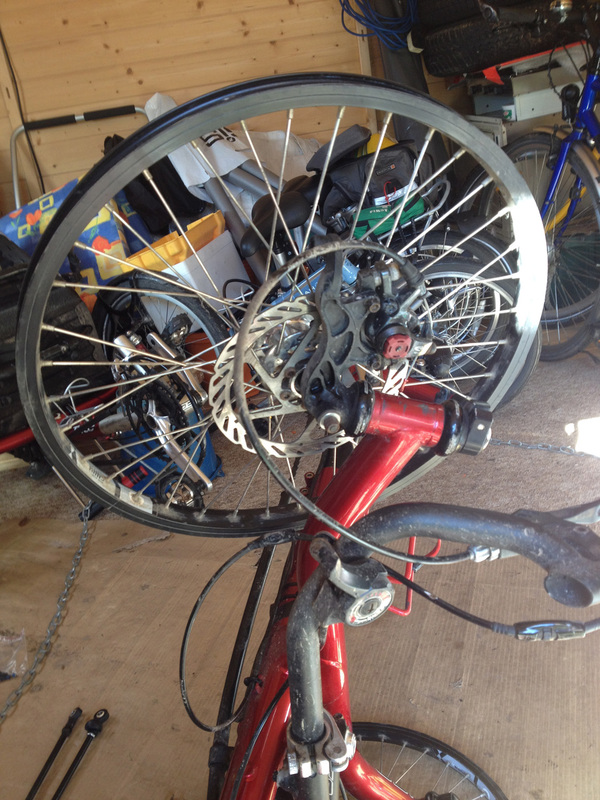 We had also removed the tyres to make it easier to measure between the wheel and the frame. The tracking procedure involves ensuring that the front wheels are toed in ever so slightly so that when the rider sits on them and adds weight they splay out to perfectly straight. This means you need the gap between the rear edges of the wheels to be 2mm wider than the gap between the front edges. With a few twists of the track rods we lined it all up (it wasn’t that difficult) and then tightened the track rod bolts so they couldn’t move any further. Here it is all done and ready for a test ride (I hadn’t yet put the gaiters over the ball joints – I wanted to ensure everything worked properly first). Please excuse the muddy seat – the dog jumped all over it when she had mucky paws. I had a very enjoyable ten mile ride to check everything out. The trike seemed really quiet (it had developed a slight rattle with the old track rods being worn) and it also felt somehow firmer/more stable – I suppose the steering previously had a very slight shimmy. 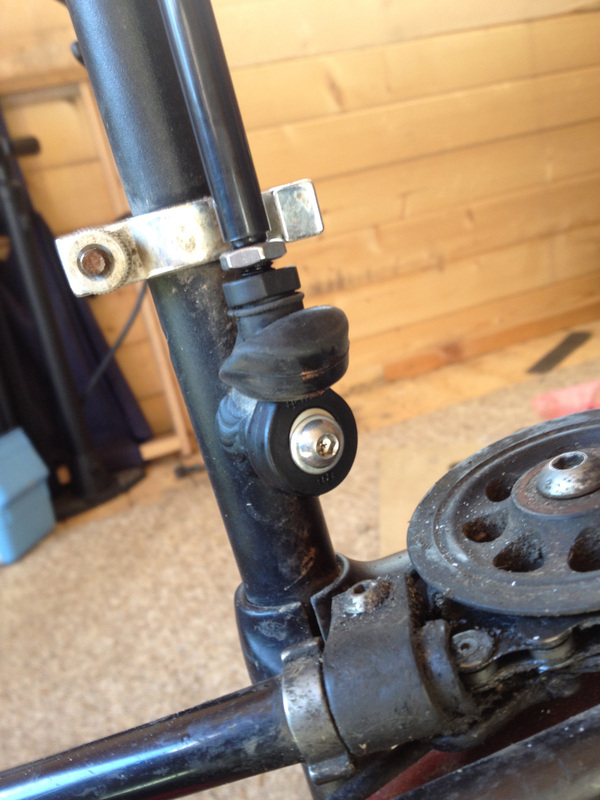 We have noticed that the bearing in the nearside front wheel is a little worn so I’ll probably need to get that changed but it’s not a major undertaking (as far as I am aware – I did it on the old trike OK), but overall the steering feels much more direct and precise now. Once I returned home it was time to tip Alfie on his side to wrestle with the gaiters. This was the hardest job of all, getting the little rubber covers over the ball joints. There were four and it took me about fifteen minutes but in the end I managed it. And here is the view from above – you can see how nicely the underside is protected from the elements now. And this is a worm’s eye view! So all in all this was a pretty easy job, it probably took us an hour in total including removing the tyres. I also gave Alfie a wash beforehand as he was filthy after riding through all the rain we’ve had this winter. He’s almost ready for his new life in Germany now! An open bolt can usually dry out after having been sprayed with muck and when they are good quality they can still be worked after decades whereas when the humidity stays it is as good as an invitation to rot. Frames and chassis often break because they rot from the inside out, just to mention it. I don’t know what ICE’s opinion would be, but I’m with Gerhard. I’d be inclined to pack those joints with lithium grease or something similar, after making sure they were dry and clean. The gaiters would them keep the grease in and the wet out. Well I assume ICE are well aware of this and have decided, on balance, this is a better option. The collar around this is VERY tight and above it there is a splayed out bit of metalwork so I’m not 100% sure water would actually drip down into it. We will see!